Loading in the kiln with materials at hand. View of front stack, cone pack (bottom right), and the arch (above) with the firebox beyond. Fiber blanket secured on and pyrometer in place. View from above of all three stacks and side stoke space. Fire on the floor, building up embers for transitioning to grate bars. View of wood burning above the grate bars. 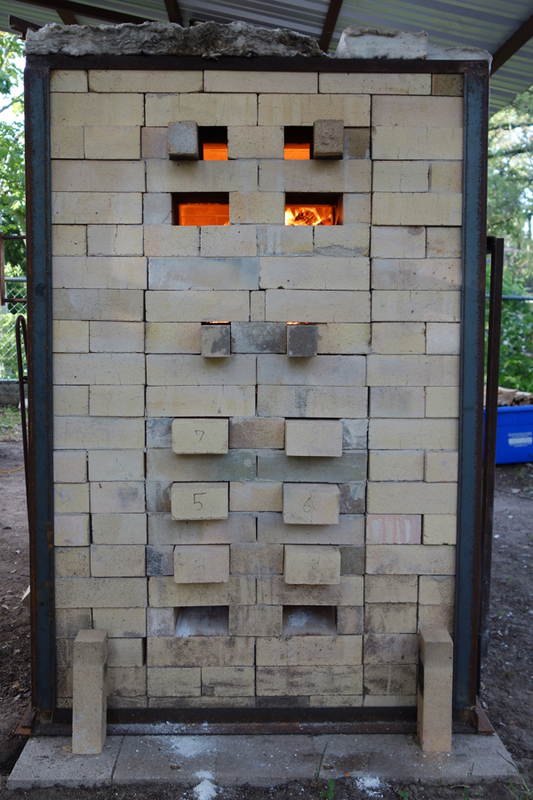 Temperature has climbed and the kiln is hot throughout. Flame quality is observed after a stoke. Four days later, the kiln has cooled. A view of the middle stack (see photo 5).